We're proud to announce the release of Descent into Darkness, available in the shop now! All of the new cards can be viewed in your collection, and of course are legal to play as soon as you have them. 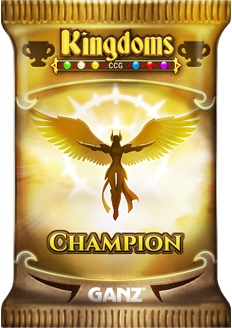 There are no new abilities in this set, though you will see our first creature that has Indestructible inherently: Realm Champion. Special thanks goes out to the Beta team that tested and hotly debated many of the cards in the set. Numerous cards were adjusted based on their feedback, making for a better, more playable set. All paid tournaments now pay out Tournament Prize Packs instead of regular boosters. Prize Packs contain all booster expansion cards from Eve to Descent into Darkness. So whether you're new to the game or an old pro, there will be the potential for cards you need in every pack. And yes, this does mean that you can win Descent cards starting today. While we recognize that some older players with large collection may prefer to just get the new cards, we want Tournaments to be a great source of cards for everyone. While the Arena doesn't look very different, it will now provide a whole new way to play Kingdoms. Starting today anyone who plays in the Arena will be part of our new PVP Ladder Season Play. Seasons are currently set to 25 days, with prizes awarded at the end of the season for both the Limited Ladder and the Standard Ladder. To prepare for this new season, all ladders have been reset. You will be starting at 1500. To be eligible for prizes you must have played a minimum of 20 Live PVP battles during the Season. Note that only Live PVP battles will affect your Ladder score in these two arenas. You can still play the AI to complete your daily quests, but your Ladder score will not be affected. We hope that this will usher in a new era of Live PVP play in Kingdoms - the best way to play! We have made one balance change in this release. Dreadful Return has had its mana cost raised from 2 to 3. Waiting in the wings we have Buffs to TWO underused Heroes, which we will announce soon. Finally, Frost Wielder is now officially on the watch list. 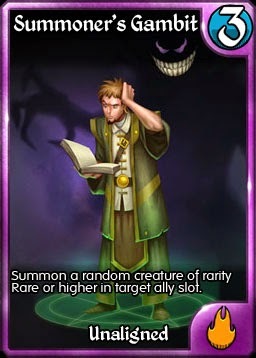 We are actively discussing the card in the Beta forums right now. A few minor copy glitches are appearing on live. 1) "Tournament" is showing up as an Expansion in Collections and the Deck Builder. We can assure you that this is not a new expansion. 2) Deepwood Druid has the new subtype "Druid" which is not appearing correctly. 3) We missed the titles for the packs in the Guaranteed Epic Descent 10-Pack. We'll be fixing all of these issues shortly.